Talk by Arrital was created for this, to give voice, to represent, but above all to seal stories, moments, events, emotions, strong signals of a brand that is close to its 40th anniversary and deserves a publication. Talk comes from the Kitchen Culture philosophy of Arrital, a vision open to contamination, creativity, and storytelling, like the kitchen environment, a place of meeting and conversation, an expressive place for design and the everyday food experience. Talk is the place of stories like the kitchen that beats the time of day and the rhythm of life. 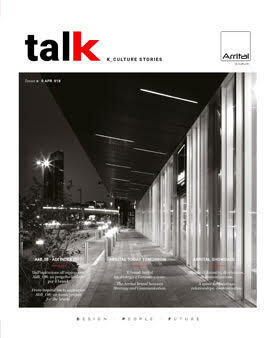 Talk, in this issue #0, monographic, will focus more on the company through its different expressions, but in the next editions it will dedicate space and value to the trends, stories, facts, and people who share the work and passion for furniture and contemporary design.